IN HONOR OF VETERANS DAY, Nov. 11, 2014 —Minnesotan Adam Lindquist’s award-winning portrayal of America’s 26th president, Theodore “Teddy” Roosevelt, entertained a roomful of guests and veterans at Covenant Village of Golden Valley on Tuesday, Nov. 11. 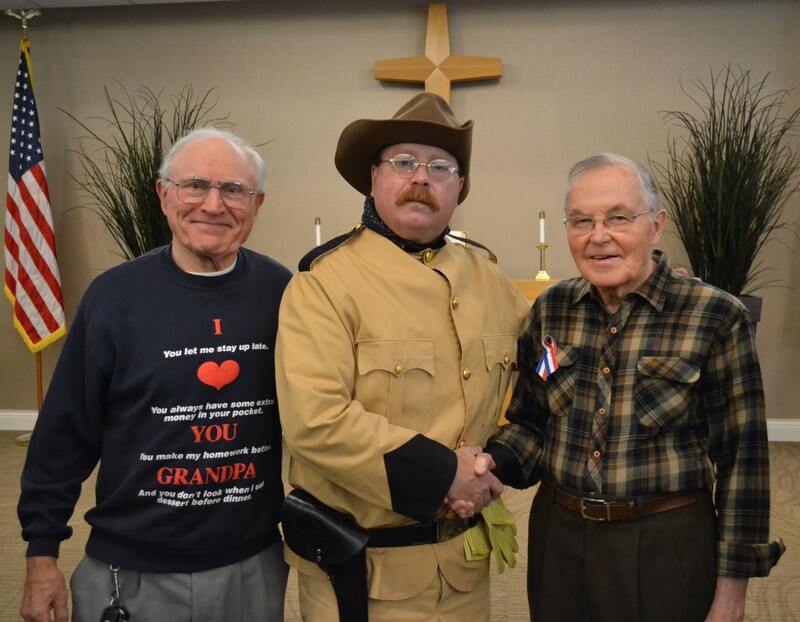 Pictured, left to right, Brooklyn Park, Minn.-resident Marvin Ceynar; Adam Lindquist as Teddy Roosevelt; and U.S. Navy veteran and Covenant Village of Golden Valley resident Wally Swanson. Veteran’s Day as we know it didn’t exist when Roosevelt was President. It wasn’t until November 1919 that President Wilson proclaimed November 11 as the first commemoration of Armistice Day with the following words: “To us in America, the reflections of Armistice Day will be filled with solemn pride in the heroism of those who died in the country’s service and with gratitude for the victory, both because of the thing from which it has freed us and because of the opportunity it has given America to show her sympathy with peace and justice in the councils of the nations…” It was in honor of “The war to end all wars”. Even though we did not have an “official” day at the time, Roosevelt acknowledged the sacrifices of those who came before, often citing those who fought in the Civil War in many speeches he presented. The importance of Patriotism, sacrifice and honor are prevalent in the majority of Roosevelt speeches. On a personal note, I would like to take a moment to thank those who served and to honor those who gave their lives so that we could be free. Thank you is not enough to say for all you have done.